Wednesday November 3rd 1926 It was a cloudy day. I finished fixing my blue wool dress I began yesterday and in the afternoon ripped up my velvet dress to make over. I wrote Cousin Jen before dinner. Hattie over the river in the afternoon. Rob not home to supper. Letter from Winnie. Radio music in evening. To the church with Ensigns in evening to reception for The Rhods. 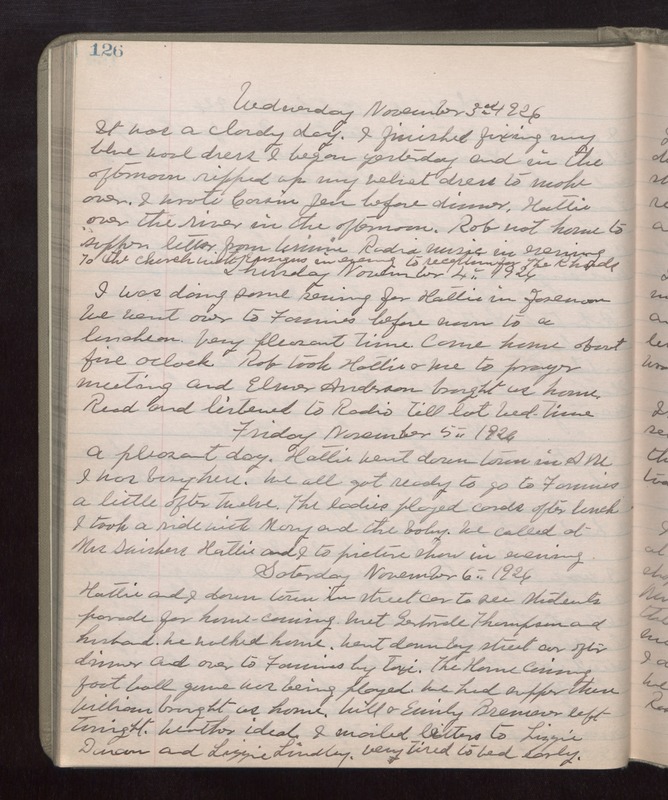 Thursday November 4th 1926 I was doing some sewing for Hattie in forenoon. We went over to Fannies before noon to a luncheon. Very pleasant time. Came home about five oclock. Rob took Hattie & me to prayer meeting and Elmer Anderson brought us home. read and listened to Radio till late bed-time. Friday November 5th 1926 A pleasant day. Hattie went down town in AM. I was busy here. We all got ready to go to Fannies a little after twelve. The ladies played cards after lunch. I took a ride with Mary and the baby. We called at Mrs Swishers. Hattie and I to picture show in evening. Saturday November 6th 1926 Hattie and I down town in street car to see students parade for home-coming. Met Gertrude Thompson and husband. We walked home. Went down by street car after dinner and over to Fannies by taxi. The Home Coming foot ball game was being played. We had supper there. William brought us home. Will & Emily Bremner left tonight. weather ideal. I mailed letters to Lizzie Duncan and Lizzie Lindley. Very tired, to bed early.